Sensational Chris Cormier’s victory in Australia in 2001 was his 3rd contest victory of the season. He was in probably the best condition of his life. The “Real Deal” does it down-under! 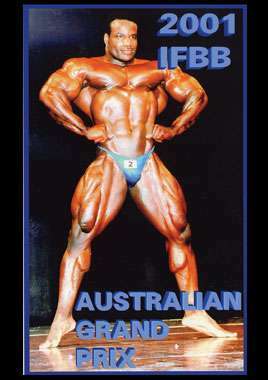 Held in Melbourne Victoria, this was the first Pro contest held in Australia for many years. For promoter Tony Doherty this was his first ever Australian Pro Grand Prix, an event which is still going strong in 2014. The DVD includes 29 minutes of key comparisons from the Prejudging, the complete posing routines of all 14 competitors and the exciting posedown and awards. Plus a special presentation to the top Australian competitor Luke Wood. Shot with 2 broadcast cameras, we captured all the action from the best possible angles for shooting bodybuilding contests. Main sponsor of the event was BALANCE MUSCLE TECHNOLOGY. Photos by Tina Gallasch.